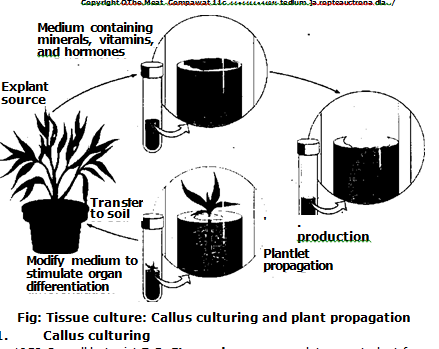 The in vitro cultivation of any part of plant in nutrient medium is called tissue culture. German botanist Gottlieb Haberlandt said in 1902 that plant cells are totipotent. lot potent means each cell has the full genetic potential of the organism. Therefore a single cell can become a complete plant. There are different techniques of tissue culture. Some of these are callus culture, anther culture. suspension culture. 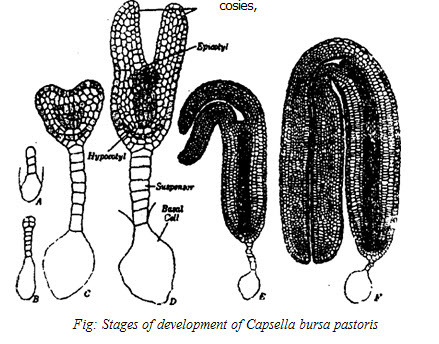 ovule culture. 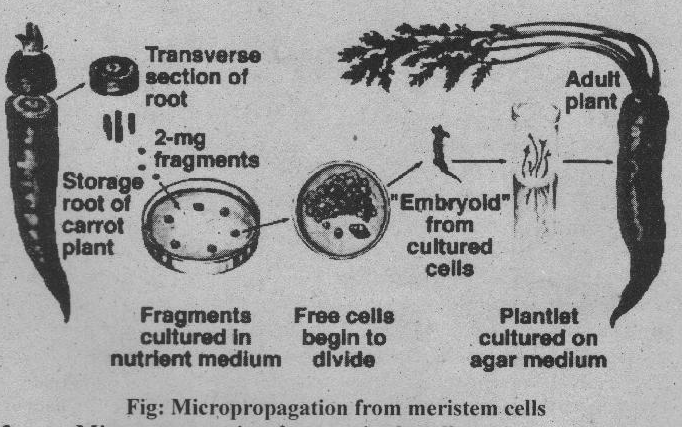 embryo culture protoplast culture and micropropagation. In 1958 Cornell botanist F.C. Steward grew a complete carrot plant from a tiny piece Of phloem. He provided the cells with sugars, minerals, vitamins and coconut milk. Coconut milk contains the plant hormone cytokinins. The cultured cells began dividing, they produced a callus. An undifferentiated group of cells is called callus. Then the callus differentiated into shoot and roots and developed into complete plants. Callus culturing provides genetic variability. The variations induced in plant through tissue culture are called somaclonal variations. (a) The shoots are genetically.’ identical to the adult plants. Thus the plants developed from them are called clonal plants. All the clonal plants have the same traits. (h) Meristem is virus free. Therefore the plants produced are also virus free. The presence of plant viruses weakens plants. Thus makes them less productive. (a) Enzymes are used to digest the cell walls of a small piece of tissue. These tissues’are mesophyll tissue of a leaf. It produces naked cells without cell walls. It is called protoplasts. (b) The protoplasts regenerate a new cell wall and begin to divide. This division forms clumps of cell. (c) These clumps of cells are used to produce somatic embryos. (d) Somatic embryos are covered in a protective hydrated gel. It is called artificial seeds. Millions of somatic embryos can be produced at once in large tanks called bioreactors. This is done for certain vegetables like tomato, celery, and asparagus. (e) A mature plant develops from each somatic embryo. Mutations can take place during the production of these plants. Therefore, the plants generated from the somatic embryo vary from each other. These are called somaclonal variations. These somaclonal variations can be used to produce new plants with desired traits. (b)Cell suspension of Digitalis lanata produces digitoxin. It will be possible to maintain cell suspension cultures in bioreactors. This cell suspension culture will be used for producing different chemicals. These chemicals will • be used in the production of drugs, cosmetics and agricultural chemicals. Thus it will not be necessary to farm plants for the purpose of acquiring the chemicals. (a) Mature anthers are cultured in .a medium. This medium contains vitamins and growth regulators. (b) The haploid tube cells within the pollen grains are divided. They produce proembryos. The proembr> os consists 20 to 40 cells. (c) Finally the pollen grains rupture and release the haploid embryos. (d) A haploid plant can be produced experimentally from this haploid embryo. (e) A chemical agent is added into haploid embryo. This chemical encourages chromosomal doubling. As a result diploid plants are produced. These plants are homozygoms for all their alleles.Anther culture is use to express recessive alleles in plants. Sometimes, recessive alleles govern desirable traits. Thus the plants express these traits. It is an important technique in modern plant breeding. In this case, whole ovule is cultured. This technique is used to for direct hybridization of various species. I. It is used to reproduce plants which do not reproduce by normal methods. It is used to express the recessive traits. It is used to study the effect of different hormones on plant. It gives virus free plants. It is method of rapid propagation of plants. It gives monoclonal and soma clonal plants. Suspension culture is used to produce different types of drugs and alkaloid.